Bro. Matt's Blog Has Moved!!!! Yep, that's right. I have decided to totally 'redo' my blog and be as 'radically intentional' with it as possible. Click here to go directly to the blog called "The HEART of Pastor Matt". "3. Biblical encouragement is a primary means God uses to keep us saved." I based this statement from what the author of Hebrews says in Hebrews 3:12-14 - "Take care, brothers, lest there be in any of you an evil, unbelievingly heart, leading you to fall away from the living God. But exhort/encourage one another every day, as long as it is called 'today,' that none of you may be hardened by the deceitfulness of sin. For we have come to share in Christ, if indeed we hold our original confidence firm to the end." Let me assure everyone reading this blog: Matt Pearson believes in the doctrine of eternal security!!! The Bible is loud and clear about that from the beginning to the end. Denying that denies much of the Bible and the beautiful grace of God in salvation. My hope is that God will keep me saved today and tomorrow and forever; not in Matt Pearson's works. But I also MUST let the Bible speak and let the Bible drive my convictions and theology and doctrine, not my preconceived ideas and notions. I believe in the doctrine of eternal security AND I believe Hebrews 3:12-14. Now, according to Hebrews 3:12-14, if some things don't happen, believers might fall away from God. They are commanded to : (1) take care; (2) encourage one another; and (3) hold firm their original confidence to the end. If they don't, they might develop an evil, unbelievingly. heart and become hardened by the deceitfulness of sin - leading them to fall away from God and not share in Christ in the end. (b). Diligently heed the command/warning, seeing it as a gift of God's grace for me and the church to stay saved. Which do you think is more biblical? Which defines a child of God more concretely? Of course, (b) is the correct response. Jesus said in Matthew 24 that the one who endures to the end (by following Him in obedience) will be saved. Likewise, Paul said to work out your salvation with fear and trembling in Philippians 2. So, do I believe that once a believer is authentically saved by the grace of Christ and the Spirit of God that he/she will ALWAYS be saved? You betcha. But I also believe (because of texts like Hebrews 3:12-14) that this includes the fact that God graciously uses means to keep us saved, one of them being that the church heed the command to encourage one another to the end. Why else is the Bible here? Was not the majority of the NT written for churches??? Why is it all there unless it is to be used as a means to keep the church graciously and gloriously saved? Why would we need each other if we could get by as believers all by ourselves? We can't!!! This is why God graciously gave us each other. God graciously uses means to keep us saved, so diligently and intentionally encourage one another TODAY. By doing so, you reveal the Spirit's work in your own heart (bringing confirmation to your soul of God working in and through you); AND you just might be a means God has ordained to keep a brother or sister from falling away from the living God. Due to the '242-Sharing Life Together' Series on the 'One Anothers' of the New Testament this summer, all discussion questions for the Sunday morning messages (June-July 2011) can be found at this link at the Wynne Baptist Church web-site. As for the message on Haggai, I preached last night, I will simply encourage you to consider the implication questions I posed at the close of the sermon. You can watch or listen to the message here. 1. 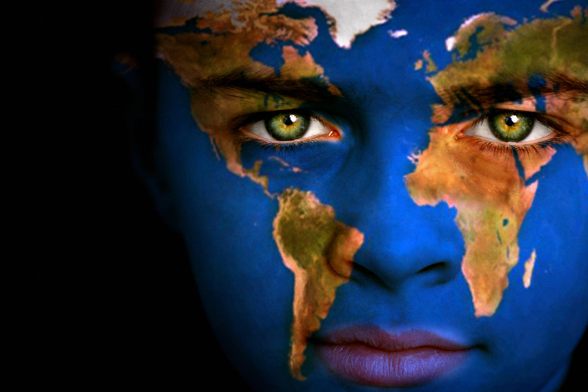 WBC, Consider Our Ways: A Superior Temple, and the Display of God’s Glory Remains Incomplete…What are We Doing about It? 2. WBC, Consider Our Ways: The Amount of God’s Spirit You Experience and Your Practice of Obedience…Is there a Connection? 3. WBC, Consider Our Ways: God Keeps His Promises…Do You Believe It? Last night, I referenced/recommended Give Them Grace: Dazzling Your Kids with the Love of Jesus by Elyse Fitzpatrick and Jessica Thompson. You can order the book directly from Amazon by clicking here. I also mentioned a very helpful interview with Elyse Fitzpatrick about the book. You can listen and/or watch the interview here. Earlier this week, I came across this Bible reading plan by Jason DeRouchie. Click here to link to where I found it (Desiring God) and to a link where you can download the plan in a PDF format. 1. Proportionate weight is given to the Old and New Testaments in view of their relative length, the Old receiving three readings per day and the New getting one reading per day. 2. The Old Testament readings follow the arrangement of Jesus’ Bible (Luke 24:44––Law, Prophets, Writings), with one reading coming from each portion per day. 3. In a single year, one reads through Psalms twice and all other biblical books once; the second reading of Psalms (highlighted in gray) supplements the readings through the Law (Genesis–Deuteronomy). 4. Only 25 readings are slated per month in order to provide more flexibility in daily devotions. 5. The plan can be started at any time of the year, and if four readings per day are too much, the plan can simply be stretched to two or more years (reading from one, two, or three columns per day). 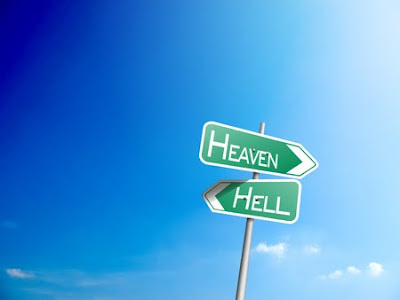 What About the Books on Brief Heaven and Hell Experiences??? There is alot of talk out there about books such as 90 Minutes in Heaven and Heaven is For Real and 23 Minutes in Hell. Randy Alcorn thinks through this issus (these issues?) here. "Acts 17:11 tells us that the Bereans searched the Scriptures daily "to see if what Paul said was true." Now, if ever in human history you were going to assume that another person's words were true, not finding it necessary to double-check against the Scriptures, surely it would be with the Apostle Paul. Yet the Bereans were commended for carefully scrutinizing Paul's words in light of Scripture. If Paul's words needed to fall under the judgment of God's Word, obviously mine do, and Don Piper’s do, and Todd and Colton Burpo’s do. "I do believe that something is seriously wrong if people take more time to contemplate and discuss Colton Burpo’s account of petting Jesus' rainbow-colored horse, or of Jesus wearing a crown with a pink diamond, than they do studying what the Bible actually says about Heaven. The back cover of the book says 'Heaven Is for Real will forever change the way you think of eternity.' I would say, 'Seek to let the Bible alone change the way you think of eternity.'" 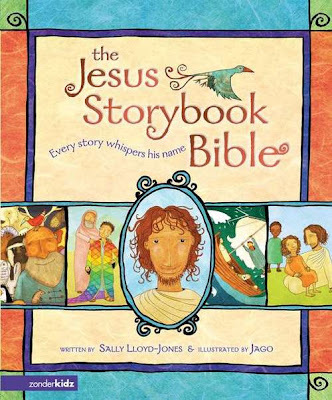 Yesterday morning I mentioned several books that would be helpful for any parent longing to see their children grow knowledge of and love for the Jesus of the biblical Gospel. At The Gospel Coalition web-site, they link to this helpful talk entitled "How to Teach Children and Youth the Gospel Story." Also, tomorrow night (May 10, 2011) Desiring God will be interviewing Paul Tripp (Tedd Tripp's brother) on the topic of "Getting to the Heart of Parenting." I am sure it will be very, very helpful for any and all parents - especially when it comes to applying the Gospel. The Gospel Coalition has grown to be one of my favorite websites to visit for solid, helpful resources concerning all things evangelical. One of my favorite aspects about it is its attention to helping followers of Christ to read and understand all of the Bible as Christian. In other words, it helps us see the connections between Jesus and the Old Testament. For helpful resources on how to grow in your understanding of how to read and understand the Bible from this perspective, click here. The Gospel Coalition is doing a tremendous service to the church by making these interviews, articles, workshops, etc. available. Also, The Gospel Coalition recently hosted a conference where this (Christ and the Old Testament) was the entire theme. Click here to go directly there. Enjoy. May our hearts burn together as we learn the Scriptures with the proper Gospel lens. Yesterday morning I preached a message entitled "Enormous Emmaus Emotions caused by the Ever Enlightening Emmanuel" from Luke 24:13-35. You can watch, listen, and/or download the message here later today. 1. 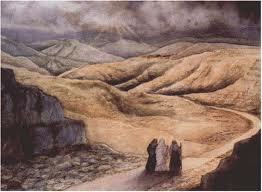 Why was the couple on the road to Emmaus so sad and hopeless? How can you relate to their hopelessness? Have you ever said to yourself, "I had hoped..."? What about? 2. How did Jesus' resurrection change all of that? Why is His resurrection from the dead such a big deal and what are some of the implications of it? 4. According to this text, what causes hearts to burn for the things of God? What does this mean for your own heart? What does this mean for the hearts you have influence over? 5. What do you think happened that caused the couple from Emmaus to (finally!) recognize Jesus? How is this similar to what happened to Adam and Eve in the Garden of Eden (See Genesis 3:1-11)? For further treatment on this thought, click here for a very helpful and detailed article by Dane Ortlund. 6. What did the couple from Emmaus do the moment they 'recognized' Jesus as the resurrected Messiah? What does this say about what 'grasping' the resurrection should effect in us? Last night I continued the 'Overview' series through the Minor Prophets ("The 'Not So' Minor Minors"). Last night's message was on Habakkuk. The title was "Habakkuk: From Hacked Off to Hallelujah." Click here (later today) to watch, listen and/or download. 1. Why was Habakkuk so angry the first time? (See Habakkuk 1:1-4) Why was he so angry the second time? (See Habakkuk 1:12-17) Have you ever complained at God for doing/allowing something to happen in your life that you didn't have categories for? What were/are they? 2. How did you handle it when these circumstances entered your life? 3. What were the 4 actions Habakkuk took to move from being 'Hacked Off' at God to saying 'Hallelujah' to God? Which of these actions seem the easiest? Why? Which of these actions seem to be the hardest? Why? 4. According to Habakkuk 3:17-19, what happened to Habakkuk through this deal? 5. How does the book of Habakkuk mirror the story of the Gospel? 6. According to Habakkuk 2:14, where is everything headed and why does God do everything He does? How does knowing this change the way we (believers) should look at the world? 7. Habakkuk 2:4 is quoted 3 times in the New Testament. Where are they and what is the thrust of meaning behind each quote? I CANNOT Believe It's FREE!!!! I learned today that Paul Miller's EXCELLENT book A Praying Life: Connecting with God in a Distracting World is FREE for Kindle. Click here to get it and/or buy the hardcopy on Amazon. I also learned today the Tim Challies' new book The Next Story: Life and Faith after the Digital Explosion is available for free as an Audio Book for the Month of May. Click here to download it for free. 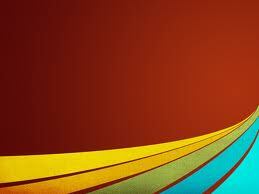 Below is a link to a web-site by Christianity Explored. I have been extremely impressed by resources they have put out in the past related to personal evangelism. They have just revamped their website and it is very 'seeker' friendly related to helping those without Christ understand more about Christianity and what followers of Christ believe and such. Use it for yourself and reference it to those whom you know and love who are searching for answers related to the things of Christ. Okay, so this will be somewhat brief...I will link to some additional resources below that I think will be helpful and for further reading. I have had several request my thoughts on the death of Osama Bin Laden. I found myself having some very mixed emotions last night, to be real honest. On one hand, I was thrilled! I mean, a mastermind who was dead set on killing as many as possible was gone?!?! That, to me, was a really good thing. On the other hand, I was grieved. How could I be happy that someone is dead? Especially someone who is (more than likely) in hell and will stay there being tortured throughout eternity? Then I checked Twitter. Oh my. First I read people rejoicing. Then I read others who were rebuking those for rejoicing. Then I read where people were sharing the same mixture of feelings that I had. Then I read Bible verses that countered others who had posted Bible verses. Yikes....made me glad I don't have a Facebook account!!!! So how should Christians think about this deal? I read a tweet by J.D. Greear this morning that really helped me balance this thing out some. He, more or less stacked two verses on top of one another and stated (in essence) that we need to wrestle with both truths. The first verse he referenced was Proverbs 24:17-18 - "Do not rejoice when your enemy falls, and let not your heart be glad when he stumbles, lest the LORD see it and be displeased, and turn away his anger from him." He also referenced Ezekiel 33:11 which says the LORD takes no pleasure in the death of the wicked. But he also (this is the part that was helpful) referenced our need to rejoice in the fact that justice was shown AND weep for the loss of life (especially one doomed to hell). God is just and demands justice. He is a LOVER of justice. Justice was served. One who was responsible for thousands of people dying (and who knows if others were being planned?) was now dead. Rejoice. But God does not rejoice in the death of wicked. Weep. I think the biblical response is to balance both: rejoice and weep. Rejoice on the biblical one hand and weep on the biblical other. Both are biblical, thus, both are right. Does Paul not himself say that we believers live in that world? "Sorrowful, yet always rejoicing"??? (see 2 Corinthians 6:10). It is okay to live in that tension. We need to wrestle with it and, at the end of the day, be totally biblical at all costs. It is a reminder, seeing the people rejoice and the Americans dancing in the streets and such, of all of humanity's struggle with justice. We all want it. We all need it. We all know that if it were practiced on us from the God of the universe then we ourselves would be destroyed. In fact, we cannot understand the Gospel fully until we understand justice. We deserve far worse than Osama Bin Laden got last week from American soldiers (who, by the way, are incredible heroes!!!! Thank you troops!). We deserve to be destroyed by God Himself due to our sin against Him and cast into an eternal hell. Another man, Jesus, was killed in our place. Justice has been served! Our penalty has been paid...by another! Hallelujah. So, at the moment, my counsel would be to wrestle with the tensions of rejoicing in justice and weeping in death. AND, please Christians, take every opportunity to go to the justice and grace of God found at the cross of Jesus. 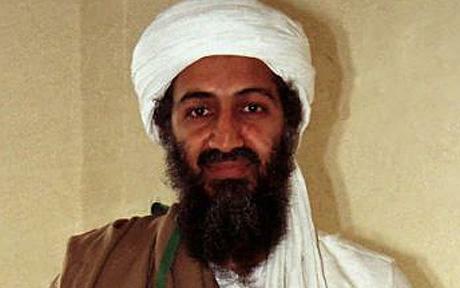 The death of Osama Bin Laden can be a remarkable way to evangelize! May it be. Click here to a couple of other posts (notice: I HAVEN'T READ THESE - they just seem to be very interesting and helpful - from a place I trust). Justin Taylor has updated some links to the above link I posted earlier here. "Vision, Clarity, and Being 'All In.' "
Personally, this is the blog post I have been most looking forward to write. I was affected by everything that happened last week. God is at work in Dubai (see post #1); the Compassion Kit Parties are remarkable ways to show and tell the love of Christ (see post #2); the Compassion Kits are phenomenal tools to present the Gospel (see post #3); and the follow-up plan is done with acute discernment and with excellence (see post #4). But for me, all of these things were highlighted, if not dominated, by a spirit of the men (and families) God has called there doing these things. It was/is a spirit that rebuked me. It was/is a spirit that challenged me. It was/is a spirit that encouraged me. It was/is a spirit that I believe allowed me to see the fruit of what I was seeing while there. It was/is a spirit that I long for. It was/is a spirit I don't see much in the lives of pastors and church leaders. It was/is a spirit that I don't see much in missionaries around the world. It was/is a spirit that I haven't had but hurt to possess. The spirit I am talking about is a spirit of passion to see the kingdom of Christ advance with violence. I saw it in the eyes of the guys we worked with. I heard it in their words. I watched it in their daily routines. I envisioned it as I heard them dream. I saw it in their wives. I saw it in their kids. I saw it happening before my eyes. As a matter of fact, one night I was having coffee (Starbucks of course...what else is there?) with the visionary of this deal and asked him, "what gets you out of bed in the morning?" I was expecting to hear something like, "I don't want these people to go to hell" or "I want Jesus to get the glory He deserves for all mankind." Though these are definitely things he wants, that is not what he said. He said, "Man, I want to see the kingdom of Christ advance across this region." When he said that a light went on. "That's it" I thought. That's what I have been seeing in these guys and their families but haven't been able to put my finger on it. These guys have totally given themselves to the advancement of the kingdom of Christ where God is massively at work in Dubai, UAE. They have a HUGE vision. Their dreams, vision, and plans have unmatched clarity to them. Here's the thing, however: I know alot of people who dream big and cast a vision and make clear plans on paper. But I haven't seen many people actually try to outwork their vision and plan and dreams. There is a HUGE difference between having a plan and casting a vision and dreaming a dream and then just hoping it all comes together and actually going to MAKE SURE it all comes together. I fear that I have seen, in my own life and in the lives of countless others, good ideas and big dreams and great visions stay on paper in the hopes that God will bless and do the work for me/them. Not these guys. They are resolute. They are "all in." They are determined to make their vision and dreams a reality and work with all of their might to see the kingdom of Christ advance while God is pouring out His waterfall of blessing there. As one of them told me several times, "There is no Plan B." In other words, they aren't thinking about what happens if it doesn't work. They aren't thinking about what happens if they need to do something else. No, no. Their hands are on the plow and they are not looking back or to the side (see Luke 9:57-62). They are looking straight ahead, waking up every morning - seeking His kingdom and His righteousness (Matthew 6:33) trusting the Word that one day the earth will be filled with the knowledge of the glory of God (Habakkuk 2:14). Before I left to go on this missions experience, I asked several people to pray that this trip be a life-changing experience for me. That I would come back a different Matt Pearson than when I left. God answered that prayer. I praise His name for it and thank Him for allowing me to stand under His waterfall of blessing for a couple of days and rub shoulders with some white-hot servants of His who are zealous for the kingdom to move with force. Anybody can plan. Anybody can dream. Anybody can cast a vision. Few, however, have the guts and the courage; few make the time and the sacrifices; few get their hands dirty and adjust their schedules; few have a zeal and a passion for it to be done; few actually believe that the world can be turned upside down for Christ; few are willing to do the hard things when no one is looking. Could it be because most are zealous for their own kingdoms to advance with violence? Have mercy on me, oh God, and replace my love for Matt's kingdom with an unparalleled passion for Yours to be spread violently around the world. All week long I have been posting some thoughts regarding my recent mission experience in Dubai, UAE. Monday, I wrote a bit about why I call this series "God's Waterfall of Blessing." Tuesday, I wrote about what is called "Compassion Kit Parties." Yesterday I tried to describe what "Compassion Kits" are all about. As I explained on Tuesday, the parties served several different parties, complete with an invitation to respond to the Gospel. Many men responded and asked Jesus to save them and be their Lord and Savior. These men (along with others at the 'parties') were quickly encouraged to be a part of a story group that would meet soon thereafter. The purpose of these story groups are two-fold: First, for those who did trust Christ to grow in their understanding of the Bible and the Lord they just surrendered to. Second, there were many (being that all sorts of religious backgrounds were represented in the room) who were intrigued by the Person and teachings of Jesus, but still wanted to know more. The story groups, which (to put it simply and basically) are weekly oral teachings of the biblical storyline led by a trained national (lasting anywhere from 10 weeks to 24 weeks), would both disciple those who trusted Christ and/or help answer questions those who were curious about Christianity - hopefully bringing more to Christ. Thus, the story groups are CRUCIAL to the work in helping solidify decisions made during the 'parties' and to further evangelize those wanting to know more before embracing Christ. You can see why the story groups were/are the primary purpose!!!!! Needless to say it got me thinking about how this sort of thing can/needs to be incorporated in the states. The guys directing and leading out in this ministry are also very intentional about ensuring these men who trust Christ understand their need of being baptized - to which they follow up on until the men are dunked! I will type more about this tomorrow - but for now suffice it to say that the overall vision for this ministry is HUGE and is backed with remarkable clarity and feet to the work. The guys I worked with last week don't just hope to see some men saved so they can write back to the states about how many men raised their hand at a party where they got some free stuff. No, no, no. These men are intentional and extreme about advancing the kingdom of Christ - where God is pouring out His waterfall of blessing. Yes, they want to see men saved. But not just a few. They want to work and plan and lead and direct and organize and arrange ministry to where those who are saved make disciples who make disciples who make disciples...in order to see a movement rock the whole place. Christian. Husband. Dad. Pastor. PhD.